The Tribe of Judah (Hebrew Yəhuda, "Praise") is one of the Hebrew tribes, founded by Judah, son of Jacob. The tribe was allotted the southernmost area of Canaan after the territory's conquest by the Israelites under Joshua. It became both the most powerful and the most important of the tribes. The religion centered on the Jewish God Yahweh first took roots among the people of Judah. From this tribe came the great kings David and Solomon and all of the kings recognized by the Bible as good. The Messiah, as a lineal descendant of David, also comes from the tribe of Judah. Together with the Tribe of Benjamin and elements of the Tribe of Levi, the descendants of Judah eventually formed the southern Kingdom of Judah in the ancient land of Israel. The Judahites were not among the "lost" ten tribes of the northern Kingdom of Israel when it fell to the Assyrians in 722 B.C.E. Instead, the people of Judah were exiled to Babylon about 586, but were eventually able to return and rebuild their nation. In time, the tribe of Judah became identified with the entire Hebrew nation and gave its name to the people known today as the Jews. By the time of the Exodus, the tribe of Judah had reportedly increased to the number of 74,000 males (Num. 1:26, 27). The clans which then composed the tribe are said to have been the Shelanites, Perizzites, Zerahites, Hezronites, and Hamulites (Num. 26:19-22). Judah marched at the front rank on the east side of the Tabernacle (Num. 2:3-9; 10:14); its standard, as is supposed, being a lion's whelp. Caleb, the son of Jephunneh, represented the tribe as one of the twelve spies sent to gather intelligence in Canaan (Josh. 13:6; 34:19), being the only one other than Joshua to deliver a faithful report. Under Caleb, during the wars of conquest, Judah conquered that portion of the country which was later assigned to it as its inheritance (Josh. 14:6-15; 15:13-19). Judah's inheritance was at first fully one-third of the whole country west of the Jordan River, in all about 2,300 square miles (Josh. 15). However, a later distribution gave Simeon about one thousand square miles out of the portion of Judah (Josh. 19:9). That which remained to Judah was still very large in proportion to the inheritance of the other tribes. The boundaries of the territory are described in the Joshua 15:20-63. It is said to have extended south as far as Kadesh Barnea, about 50 miles south of Beersheba, and west as far as Gaza, Ashdod, and Ekron. This allotted Judah a territory that included lands and fortified cities still under control of the Philistines, Jebusites, and other Canaanite peoples, with whom they would struggle for centuries. 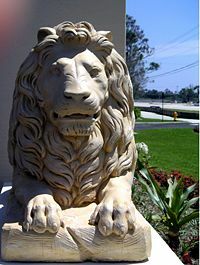 The tribe of Judah is said to have been the first tribe to successfully attack the Canaanites after the death of Joshua. However, its triumphs described in the first chapter of the Book of Judges—including victories over the Philistine cities of Gaza, Ashdod, and Ekron as well as the Jebusite city of Jerusalem—appear to be either exaggerated or short-lived. The Philistine strongholds and Jerusalem remained uncaptured, and Judges 15 describes a situation in which the men of Judah admit that "the Philistines are rulers over us." From the Judges 1:16 it is learned that the non-Israelite people known as the Kenites united with Judah and apparently became a clan of the tribe. Some scholars speculate that something similar may have happened with some of the other clans of Judah, particularly the Perizzites. The Bible usually lists this people as a Canaanite tribe against whom Israel must fight (Gen. 3:8 and 15:19, etc. ), but Numbers 26:20 identifies them as part of the tribe of Judah through his son Perez. Thus the Perizzites may have actually joined Judah in Canaan and later were "adopted" into Judah's origin-story. Judges 1:4 may hint at the moment when it states that "Lord gave the Canaanites and Perizzites into their hands and they struck down ten thousand men at Bezek." Judah is not mentioned in the song of Deborah (Judges 5) among the tribes who joined in that war against Canaanite forces. Nor does Judah appear to have cooperated in any of the exploits of the judges except its own member, Othniel. 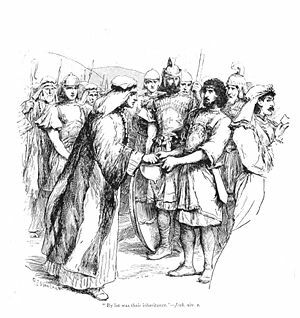 On the other hand, Judah joined with its Philistine overlords in the attempt to capture the judge Samson, a member of the tribe of Dan (Judges 15). However, Judah did support the other tribes and took the lead in punishing the tribe of Benjamin for its sin with regard to the affair of the Levite's concubine (Judges 18-19). In the accounts of the kingdom of Saul, Judah is given a distinct identity from the other tribes (1 Sam. 17:52, 18:16). After Saul's death, David established a separate Kingdom of Judah (2 Sam. 2:1) while the northern tribes remained loyal to the house of Saul under his heir, Ish-bosheth. After seven and one-half years, with the defeat of Ish-bosheth, Judah and Israel were united under David's kingship. Although several rebellions arose, this union continued for 80 years, through the reign of King Solomon. After the division of Judah and Israel under Rehoboam and Jeroboam I respectively, the history of the tribe of Judah becomes fused with that of the Kingdom of Judah itself. The tribe of Benjamin, together with a considerable portion of the priestly Levite tribe attending to duties in the Temple of Jerusalem, joined Judah in this nation. It is especially noteworthy that the prophetic movement of Yahwism took root in the territory of Judah. It became at times the state religion of that kingdom, and formed the basis for the religion later known as Judaism. 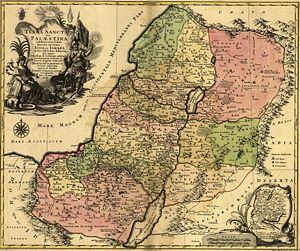 While the northern tribes were effectively scattered and "lost" after the Assyrian conquest of the Kingdom of Israel in 722 B.C.E., the Judahites were able to maintain their ethnic and cultural identity after being exiled to Babylon under Nebuchadrezzar II of Babylon in 587. Under Cyrus the Great of Persia, many returned to Jerusalem, rebuilt the Temple and established a national identity as "Jews" which has lasted until this day. The northern tribes reconstituted to some degree in Samaria, but were denigrated by the Jews for intermarrying with foreign peoples and for worshiping outside of Jerusalem at Mount Gerizim. What remained of the northern tribes either evolved into the Samaritans, assimilated with Judah as "Jews," or were simply considered to be "lost." Nearly all Jews today consider themselves as descendants of the tribe of Judah. Some do claim membership in the Levites, the priestly clan that—like other Jews—was exiled to Babylon and returned to rebuild the Temple. However, Jews with family names such as Levy (Levi), Rubin (Reuben), Simon (Simeon), Benjamin, Asher, etc. are unable to document their genealogies as going back to these historical tribes. History of "Tribe of Judah"